The esports industry in 2018 is made up of several professional leagues and tournaments held around the world and the amount of competitions is growing at an exponential rate. 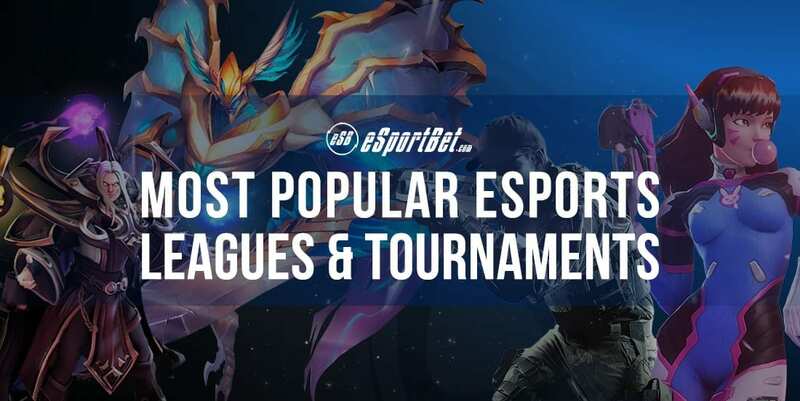 Gaming publishers like Blizzard and Valve are hosting massive competitions for their biggest esport hits, while major organizations like Electronic Sports League and Major League Gaming run sell-out events show-casing the best teams across multiple esports. Regional qualifiers and minors organized by smaller groups with official sponsorship or blessings round out the considerably large list of leagues held annually. Almost all esports competitions are physical events. Players and teams travel to one location to play live in front of an audience and camera, which live-streams the action in real-time to viewers around the world. There is a small number of online-only tournaments, but these usually offer smaller prize-pools or act as qualifiers to the bigger, main event. It can be hard to keep track of the most relevant esports leagues and tournaments in a time when esports is booming around the world, so this page will be your guide to the biggest events for each popular esports title in 2018. Official esports leagues and tournaments are presently dominated by a small number of big-name organizers. The Electronic Sports League (ESL) is the largest third-party esports organization in the world, hosting ESL-branded pro leagues and tournaments at national and international levels for the most popular games and up-and-coming titles. ESL partners with gaming publishers like Blizzard Entertainment, Riot Games and Valve Corporation for their competitions, which is the reason for their global prominence and large prize-pools. Major League Gaming is another esports tournament organizer mostly limited to North America. South Korea has a large number of local esports organizers and television networks which run competitions in the region, including KeSPA, OnGameNet and SPOTV Games. In 2018, more esports leagues are being run directly by the creators and publishers of the esports themselves, with full seasons, play-offs and finals events rather than the typical smaller-scale three-day format of the past. Blizzard runs Overwatch League, the premier league for international Overwatch competition running all-year, while Riot Games and Valve run and host their very own world championships for League of Legends and Dota 2, respectively. There are a number of traditional sporting organizations partnering up with gaming publishers to create entirely new esports leagues. In 2018, both the NBA 2K League and Electronic Major League Soccer will launch their inaugural seasons, with the full backing and support of the NBA and Major League Soccer to bring them into the mainstream. Counter-Strike: Global Offensive first released in 2013 and has a number of leagues and competitions held around the world sponsored by Valve andorganized by third-party organizers, show-casing the top CS:GO talent in the online scene. CS:GO Pro League: Organized by the Electronic Sports League and E-Sports Entertainment Association, CS:GO Pro League (also called ESL Pro League) is the premier worldwide league for the game and features multiple month pro league seasons in Europe and North America, with 12 teams participating in each region. The CS:GO Pro League is scheduled around Valve’s Major tournament system and culminates in multiple offline finals held in England, Germany and North America at the end of the year. ELEAGUE: A professional esports league which broadcasts its events on North American television channel TBS, with Counter-Strike: Global Offensive as its primary featured esport. The ELEAGUE features sixteen of the best CS:GO teams picked from around the world competing in two 10-week league seasons annually, with a regular season, play-offs and championship finals. Dota 2 first released in 2013 and has established numerous professional competitions with the backing and involvement of the game’s developer and publisher, Valve Corporation. Dota Major Championships: A series of regional tournaments scheduled and sponsored by Valve and produced by third-party organizations such as ESL. Split into two tiers with the same rules, Majors and Minors, these events act as paths for qualification to The International at the end of the year and are run in China, Europe, North America, South America, Southeast Asia and Commonwealth of Independent States (CIS) regions. Majors have a minimum prize pool of $1 million (half from the organizer and half from Valve) while Minors have a minimum of $125,000 in prizes. Notable examples include the IEM Katowice in Poland and the Kuala Lumpur Major in Malaysia. The International: The annual World Championship Dota 2 esports tournament run by Valve Corporation since 2011 and officially the largest and highest-paying esports tournament in the world based on audience (400,000 million) and record-breaking prize-pools (US$24 million). The International features 18 of the world’s best teams, both directly invited and qualified, in a double elimination tournament format played best of one, best of three and best of five as the series progresses. Football is one of the most popular sports in the world so it’s only natural to witness the rapid creation of several regional esports leagues for the annual FIFA video game franchise. Electronic Major League Soccer (eMLS): The official e-League for FIFA 18 run by Major League Soccer, North America’s major professional soccer league. The eMLS is in partnership with EA Sports, the developer and publisher of the FIFA video game series and will feature high-level FIFA 18 competitions. Players who participate in the eMLS will represent their favourite clubs in the EA Sports FIFA 18 Global Series Playoffs later this year, and the eLMS will act as a regional pathway to the annual Fifa eWorld Cup. FIFA Global Series and eWorld Cup: Formerly known as the FIFA Interactive World Cup (FIWC), the FIFA eWorld Cup is an annual video gaming competition officially organized by FIFA in partnership with EA Sports and is one of the biggest online gaming tournaments in the world. Players qualify via the FIFA Global Series, with the top 60 points earners on the Playstation and Xbox leaderboards progressing to playoffs. Only 32 players compete at the eWorld Cup Grand Final, which is held in August each year. Football Federation Australia E-League: The official e-League for FIFA 18 run by Football Federation Australia, representing the highest level of soccer in the region via the Hyundai A-League and Westfield W-League. It will run concurrently with the final nine rounds of the A-League in its inaugural season and will culminate in a tournament style final event, letting the best players represent their favourite A-League club, with one pro player chosen per club. After having a thriving esports scene in the mid-to-late 2000s, Halo’s competitive circuit has been consolidated into one annual tournament series organized by franchise developer 343 Industries and long-time collaborator Major League Gaming. Halo World Championship: The HWC is the largest esports event held for competitive Halo since 2014. Sponsored by current Halo developer 343 Industries, the 2018 season is produced by the Electronic Gaming League and Major League Gaming and features multiple regional qualifiers where teams fight for points and overall standing, culminating in a Championship finals at the end of the year. League of Legends first released in 2009 and has had nearly a decade to establish several leagues across the world, with every single one of them having the official support and sponsorship of LoL’s developer and publisher, Riot Games. League of Legends Championship Series (EU and NA LCS): The EU and NA League of Legends Championship Series are the premier national LoL tournaments in their respective regions, acting as the path for European and North American to earn their way to the World Championships. Each annual season has the top ten teams battle for top standings in seasonal splits to qualify for the play-off series and earn the most championship points to qualify for the LoL World Championships at the end of the year. In 2018, both the EU and NA LCS removed mid-year promotion/relegation to use a single league, double round robin Bo1 (Best of 1) tournament format as part of Riot Games’ franchising restructure. League of Legends Champions Korea (LCK): The premier League of Legends esports tournament in South Korea that acts as the road to qualification for the international World Championships. The LCK features 10 of the best LoL teams across seasonal splits and double round-robin basis similar to its EU and NA cousins, but games are played in a Bo3 (Best of 3) tournament format which provide longer matches. LCK is considered to be one of the most competitive regional LoL leagues in the world. League of Legends Pro League (LPL): The premier League of Legends esports tournament in China that acts as the road to qualification for the international World Championships. Oceanic Pro League (OPL): The premier League of Legends esports tournament in Australia and Oceania that acts as the road to qualification for the international World Championships. League of Legends World Championship: The annual professional League of Legends world championship tournament hosted by Riot Games and the culmination of each season across the game’s multiple national leagues. The best 24 teams from around the world are invited to participate in a double round robin, Bo1 (Best of 1) format and advance their way through numerous stages to make it to the play-offs and eventual finals. The final prize-pool for last year’s Worlds was a whopping US $4,946,970 and is set to be beaten in this year’s event. Overwatch was released in 2016 and has a smaller number of esports leagues and tournaments as a result, but this year arguably introduced one of the most popular new leagues in recent history. Overwatch APEX: APEX was run by OnGameNet (OGN) for five seasons until its cancellation in early 2018. It was one of the only major esports leagues for professional Overwatch players to enter prior to the announcement and establishment of the Overwatch League, run by Blizzard Entertainment. Overwatch League: The premier esports league for Overwatch run by Blizzard Entertainment, the creators and publishers of the game. With a division and franchise structure instead of team promotion and relegation, the top teams across North America, South Korea and the United Kingdom play each other twice a week across a regular season (four stages of five weeks) for placement in the championship play-offs and eventual finals. It is arguably the most popular new esports league of 2018, with millions of viewers tuning in across Twitch.tv and MLG.tv. Overwatch Open: A one-off tournament hosted by ELEAGUE and broadcast on North American television cable network TBS in 2016, the Overwatch Open featured eight of the best teams from Europe and North America to win a share of the US $300,000 prize-pool. Overwatch World Cup: A prototype Overwatch esports tournament organized by Blizzard Entertainment, it ran for two series in 2016 and 2017 as part of the BlizzCon convention at the Anaheim Convention Center. It pitted the world’s best Overwatch teams against each other in a 32 team round-robin group stages, with a 8 team single-elimination playoff structure. It was cancelled due to Blizzard re-focusing its efforts to establish the Overwatch League. The NBA 2K video game series is an annual franchise and thus will change up every year as its one and only officially-sanctioned e-League adapts to the newest entry. While plenty of amateur tournaments and smaller competitions have been hosted, only the 2K League is recognised as a major NBA 2K esports league. NBA 2K League: The first and only professional esports league advertised, managed and endorsed by the NBA in partnership with 2K Games. Set to launch in mid-2018 after a series of virtual try-outs, the League will feature intense 5v5 matches with players using customised MyPlayers provided by the 2K League with a rating of around 90 each. 17 of the NBA’s 30 teams are confirmed to be a part of the inaugural 2018 2K League season. PlayerUnknown’s Battlegrounds had its full retail release in late 2017 and is yet to have an official esports league established by its creator or publisher. However, it has not stopped several third-party esports organizations from hosting competitive PUBG events, with the most notably being ESL via its Intel Extreme Masters banner and OnGameNet, a South Korean television network which exclusively broadcasts its own organized esports tournaments. Intel Extreme Masters PUBG Invitational: A recurring PUBG competitive tournament which has run twice at Intel Extreme Masters in Oakland, USA and Katowice, Poland. The most popular pro players and live-streamers are invited to participate via Open Qualifiers where only the top-ranked teams proceed. The best teams in the world are directly invited to duke it out in private Closed Qualifiers or to the event itself. So far all Invitationals have offered over US $200,000 in prize money, and have effectively acted as smaller-scale prototype events for a future PUBG esports league. OGN PUBG Survival Series: After a lofty promise to build a state-of-the-art facility for PUBG esports tournaments, the South Korean OnGameNet (OGN) television network delivered with the PUBG Survival Series (PSS), comfortably fitting 20 teams of four (80 players) on-stage in front of a huge live audience. Split into two leagues to accommodate solo and squad competitors, the PSS solo league features 140 players divided into two groups of 70, while the PSS squad league 20 teams from the top five from OGN’s early qualifier events. While the series is still in beta, we expect OGN to push it as hard as they did with Overwatch APEX. Where can I bet on these esports leagues? There are a small number of highly-rated and licensed esports betting sites which service the international esports community with betting markets on the latest competitions and tournaments, though traditional sportsbooks tend to only take wagers on major events like Overwatch League and The International. If you want to bet on match-ups in your favourite esports leagues, popular or obscure, we’ve compiled a list of our top-ranked options below. Arcanebet: An esports-focused online betting site with numerous markets up for both popular and niche esports leagues, including Dota Pro Circuit, ELEAGUE, League of Legends Championship Series and Overwatch League. Read Arcanebet review. BetOnline: A sportsbook focused on providing North American bettors with the best esports betting markets on the most popular tournaments, such as League of Legends World Championships, Overwatch League and The International. BetOnline review. Betway: An online bookmaker and active sponsor of Ninjas in Pyjamas, Dreamhack, ESL and many other esports ventures focused on providing European and United Kingdom punters with the most competitive odds on a variety of leagues, including ELEAGUE, EU LCS, FIFA eWorld Cup, Overwatch League and more. Betway esports review. Pinnacle: A sportsbook popular with the esports crowd for its early betting markets and low mark up on the odds, where you can wager on niche tournaments like the Halo World Championships and PUBG Survival Series. Pinnacle esports review.